The third stage of the Clipper 2017-18 Race, officially known as Race 3: The Dell Latitude Rugged Race, got underway today from Cape Town for its highly anticipated 4,754 nautical mile Southern Ocean sleigh ride towards Fremantle, Australia. The race start follows a fantastic stopover in the stunningly scenic city that has hosted the global sailing event nine times. 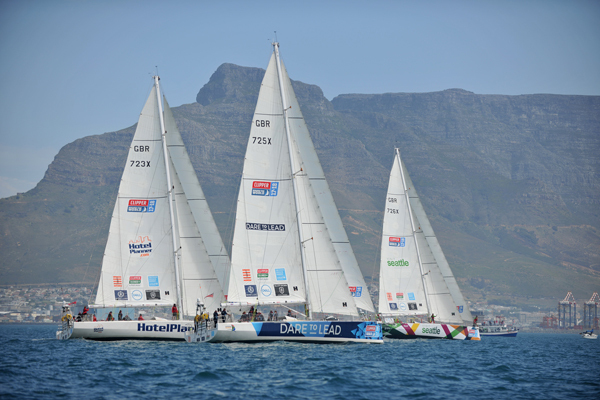 Crowds of supporters lined the marina at Cape Town’s Victoria and Alfred Waterfront to see the teams off, and following a colourful Parade of Sail in balmy conditions, the race officially got underway at 1200 UTC (1400 local time). First to cross the start line, ahead of a triangular course in Table Bay, was Capetonian Dale Smyth’s Dare To Lead team, closely followed by Visit Seattle, led by youngest ever Clipper Race Skipper Nikki Henderson, and HotelPlanner.com, Skippered by Conall Morrison from Derry-Londonderry. Sanya Serenity Coast was first to the next mark with its kite up, followed by Greenings, Unicef and HotelPlanner.com. One participant, David Marige Moroko, 26, also known as Sello, is from Dennilton, 30 km away from Groblersdal in a village called Lenkwaneng. Incredibly he had never seen the sea before he started his Clipper Race training a couple of months ago in the UK. Trevor Taylor, a member of the Fremantle Sailing Club, said: “Fremantle will be an amazing stopover for the crew and Skippers alike. This is the first race that two teams, Qingdao and Greenings, have elected to play the Joker Card, meaning that both teams will double their race points once final positions are confirmed in Fremantle. The teams are expected to arrive into Fremantle, Western Australia, between 21- 25 November. You can keep up to date with the progress of the fleet via the Clipper Race Viewer. Think you have what it takes to embark on the Southern Ocean? You can apply to take part in the 2019-20 edition of the Clipper Race online.